Matchmakers have been around forever – there’s seemingly always been a need for a business that brings together people looking to marry. But until relatively recently, we didn’t recognize that many other kinds of businesses – from Airbnb and American Express to Tencent and Visa – are matchmakers, too. And these businesses operate under a very different model than businesses that are dedicated to making and selling stuff. These are businesses that exist to enable different types of customers to interact. Airbnb has built a platform where people with rooms and people who need rooms can connect. Airbnb works in part because it has made it easy for those connections to happen but, critically, it works because there are enough people with rooms to rent on Airbnb that they can attract the people who need to find a place to stay. And there are enough people looking on Airbnb for rooms, to convince people with rooms that it is worth signing up with Airbnb in the first place. These dynamics go well beyond the “sharing economy” and present some amazing opportunities and some profound challenges. Three of the five most valuable companies in the world in 2015, Apple, Google, and Microsoft, use this business model. So do seven of the ten startups with the highest market values. A matchmaker, or a “multisided platform,” is one of the toughest business models to get right but when a matchmaker company ignites, it can transform the marketplace. 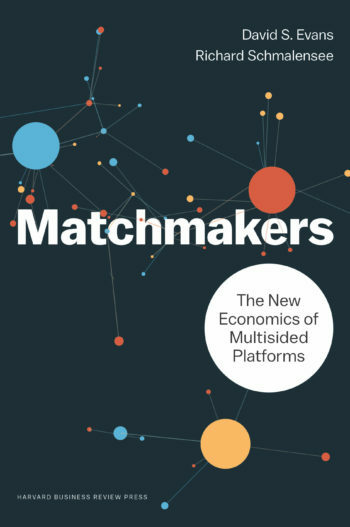 David S. Evans and Richard Schmalensee have worked with many of the country’s most innovative, and most dynamic platform businesses, and in Matchmakers: The New Economics of Multisided Platforms, they show how this essential business model is transforming economies around the world. A must-read business book for ambitious entrepreneurs … thought-provoking insight into what’s behind the exponential growth of the companies in whose footsteps we’re following. It’s a portal through which to view the economy of the future. A worthwhile, and short, read for anyone who wonders about the key drivers in different types of business. Knowing what type of business a company is operating is important both for CEOs and investors. A surprising number of business books have been published in the last few months that seek to explore the origins and implications of the emergence of the platform paradigm. The great virtue of the best of these, Matchmakers: The New Economics of Multisided Platforms … is that it reminds us that there is nothing new about multisided platforms.